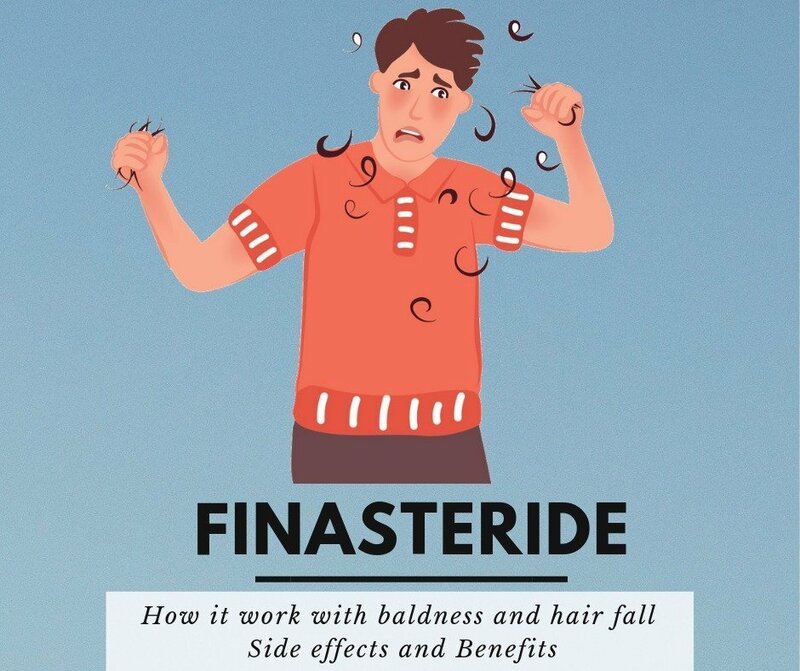 Finasteride is medicine for stopping hair loss in men and treating prostate. It slows down the conversion of testosterone to dihydrotestosterone by binding to the second-type 5-alpha reductase enzyme. Affects the root cause of baldness, but does not stimulate the growth of new hair, so it is used in conjunction with minoxidil. Holds existing hair and slows further baldness. The drug is available in pill form and is taken orally every day. What are the drugs based on finasteride? Propecia is a finasteride-based drug to stop balding. In this preparation, 1 mg of finasteride is taken for each tablet. For the treatment is taken one tablet per day. Once in the bloodstream, binding begins with the second type of 5-alpha-reductase instead of testosterone, which leads to a decrease in dihydrotestosterone levels. Dihydrotestosterone is a biologically active form of testosterone, formed from it in the cells of target organs under the influence of the enzyme 5-alpha reductase. Dihydrotestosterone is much more strongly bound to androgen receptors in tissues than the parent compound (testosterone). With the increased formation of dihydrotestosterone in the hair follicles, excessive body hair and/or “male” type of baldness on the head in both sexes are associated. -Stimulates the growth of genital organs in men during puberty. Does a decrease in dihydrotestosterone affect the body? After you start taking finasteride, the level of dihydrotestosterone will begin to decrease, which will remain at such a reduced level until you stop taking the drug. The testosterone level then increases (maximum by 10%) to compensate for the decrease in dihydrotestosterone. Gradually, the concentration of dihydrotestosterone in the hair follicles will decrease, which is required for treatment. How long to take finasteride? As long as you take finasteride, it works. If you stop taking, the effect ends. When will the first results appear? The first results can be observed after 6-12 months. In extremely rare cases, improvements may appear within three months. Can finasteride build up new hair? The drug affects the root cause and stops baldness. In some cases, the use of exclusively finasteride may be accompanied by the growth of new hair. It is rarely possible to restore most of the lost hair. However, you can use Minoxidil to grow hair. According to the instructions, take one pill of Propecia every day, regardless of the meal. FDA studies have shown that a dosage of 0.05 to 5 mg provides a similar result. The difference is 5-7% better binding of 5-alpha-reductase of the second type in favor of a higher dosage. What can play a large role in the high sensitivity of hair follicles to dihydrotestosterone. The drug is generally well tolerated. Side effects, which are usually minor, generally do not require interruption of therapy. Finasteride for the treatment of male-pattern baldness was tested for safety during clinical trials in more than 3,200 men. These side effects disappeared when stopped taking the drug. Why does finasteride not always stop baldness? 5-alpha reductase of the second type is inhibited, which accounts for about 70% of the total amount of 5-alpha-reductase in the body. But there is also a 5-alpha-reductase of the first type, on which finasteride has no effect. Therefore, this enzyme continues to exist in the hair follicles. In addition, if the follicles are hypersensitive to dihydrotestosterone, even a small amount will be enough to continue the loss. It is possible that the 5-alpha-reductase of the first type is much more active than the 5-alpha-reductase of the second in a particular individual. In this case, dutasteride, which is associated with both types, can help. No. Finasteride is used only for androgenetic alopecia, that is, for male-pattern baldness.